(e) if so, the details and the response of the Government thereto? (a) to (c): Government has launched the Pradhan Mantri Awas Yojana - Housing for All (Urban) mission on 25.06.2015. 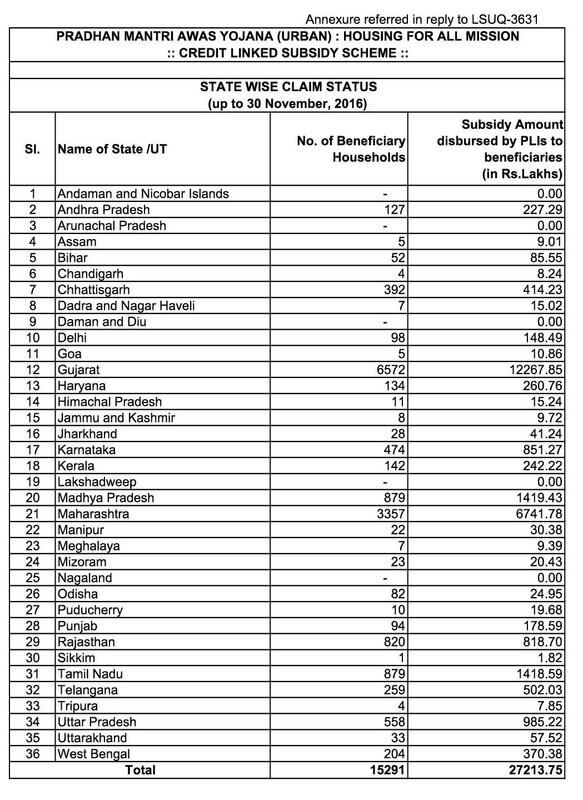 Under Credit Linked Subsidy Scheme (CLSS), one of the components of the mission, the beneficiaries of Economic Weaker Section having household annual income upto Rs. 3.00 lakh and Lower Income Group having household annual income between Rs. 3.00 lakh and upto Rs. 6.00 lakh subject to their being otherwise eligible under the scheme, can avail of interest subsidy at the rate of 6.5% on the housing loans upto Rs. 6.00 lakh from Banks, Housing Finance Companies (HFCs) and other such institutions for a tenure of 15 years or actual tenure of loan whichever is earlier, for acquisition, construction and extension of house. The Net Present Value (NPV) of the interest subsidy will be calculated at a discount rate of 9%. The carpet area of houses being constructed or enhanced under this component of the mission should be upto 30 square meters and 60 square meters for EWS and LIG, respectively in order to avail of this credit linked subsidy. The beneficiary, at his/her discretion, can build a house of larger area, but interest subvention would be limited to first Rs. 6 lakh only. The details of subsidy disbursed under CLSS, State-wise, are Annexed. (d) & (e): No such proposal is under consideration.